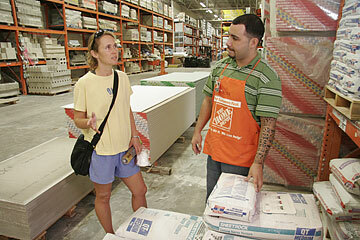 Jennifer Ryan talked with Alika Nee on Monday about fixing her leaky roof on a trip to Home Depot. With more than a month of heavy rain behind them, Windward Oahu residents have discovered that sandbags are getting hard to find. "Our sandbag supply is now pau," said Hardware Hawaii Marketing Director Larry Lanning, adding that supplies should be replenished soon. Sandbags, averaging $4 for 40 to 45 pounds at most locations, were sold out at Hardware Hawaii's three stores, two of which are located on the most heavily saturated Windward side. At City Mill Home Improvement Centers' Iwilei store, salesman Manny Flora said he ran out of sandbags Monday. In a two- to three-day period of heavy rain last week, he sold 180 bags of sand, each about 50 pounds. Assistant Manager Sandra Hee said the Hawaii Kai City Mill also ran out, and their six other branches were low, but they expected supplies to be in by the end of the week. Sandbags aren't the only things in short supply. City Mill's head cashier, Alicia Querubin, said rubber boots, raincoats, tarps and umbrellas were selling fast. Only small sizes of rain boots were left on the shelf. "This is the worst and the longest" period of rain she remembers, said Querubin, who has worked at City Mill for 14 years. Lanning said he couldn't remember ever selling out of sandbags. Rain gear, flashlight batteries, candles and other weather-related supplies are still available, he said. "We really got hit" by this "extremely unusual run of rain," said Lanning, pointing to the drop in lumber sales as construction has come to a standstill. For now, lumberyard employees are escorting customers to their cars with oversized umbrellas, Lanning said. Alika Nee, a sales associate at the Home Depot in Iwilei, said he had seen sandbags and gravel selling at two or three times the usual rate. Drywall is also going fast, as homeowners and contractors replace rain-damaged walls. Many residents are replacing rain gutters that were damaged or clogged by the heavy water flow and debris, he said. Aiea resident James Niimoto was buying fiberglass roofing at City Mill to "keep my dog dry." Even though he considered the rainfall damage rather minor, his fishpond keeps overflowing and he has lost about 100 goldfish and comets three times in one week. "It's a pretty sad thing to see all the fish swimming out and down the driveway," he said.